Confessions is the honest and heart-rending account of a woman who was born into a Catholic family, attended parochial schools and fully embraced the beliefs of her faith, but ran into major roadblocks in college. Amidst the radical feminist college environment of the 1960's, she lost her faith and her morality, jumping aboard the bandwagon of "free love." She indulged in a series of love relationships in college, all of which crashed and burned. 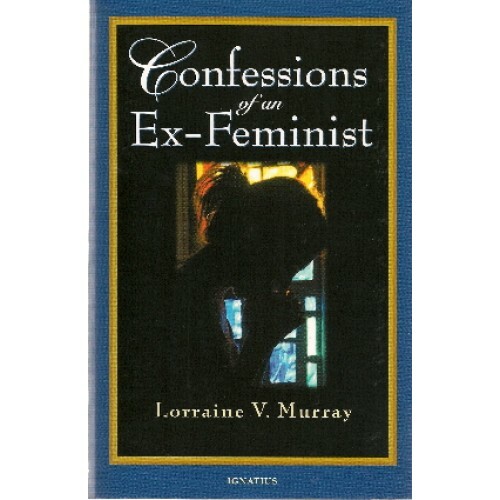 Despite the obvious contradiction between feminist teachings and her own experience, Murray still believed she had to free herself from the yoke of tradition. Attaining a doctorate in philosophy, with an emphasis on the feminist writings of Simone de Beauvoir, Murray taught philosophy in college. For many years, she launched a personal vendetta against God and the Catholic Church in the classroom, trying to persuade students that God did not exist, mocking values Catholics hold dear, and touting feminism as the cure for many social ills. When she discovered she was pregnant, Murray followed the route that feminists offer as a solution for unmarried women. Much to her surprise, her abortion was a shattering emotional experience, which she grieved over for years. It was the first tragic chink in her feminist armor. In her forties, Murray experienced a mysterious series of events in which it seemed that "someone" was inviting her back to God. The mysterious calls came from different ports, including nature, books and other people. "Confessions of an Ex-Feminist is the gripping story of millions of women who lost their religious and intellectual anchors during the tsunami of the fatal sixties and seventies. It is a movingly honest confession of how pride, arrogance, immaturity, ambition, craving to be "liberated", blinds the female soul. Abortion kills babies and wounds a woman's soul to its very core. But a prodigal daughter found her way back home, crushed by guilt, driven by repentance, and discovers that God's mercy is boundless. She is now given the crucial mission of shouting on roof's tops: feminism is the arch enemy of women. This book should become a vade mecum of young girls". "Lorraine Murray's absorbing and poignant book traces her passage from the heart of the Catholic Church to the epicenter of the sexual revolution and back again. With candor, humor and a knack for storytelling, Murray reveals the mysterious ways God worked in her soul and leaves readers richer for having shared her journey."